12 no. 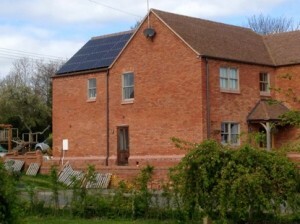 250-watt Sanyo HIT H Series Solar Panels on the south facing pitched roof elevation and connected to a SMA Sunnyboy 3000HF Inverter. The annual generation is estimated to be 2,753.0 kWh and over the next 20 years will save 25 Tonnes of Co2. 58% of the annual electricity bill will be funded by the FIT scheme. The system Payback time is estimated at 8 years 6 months.